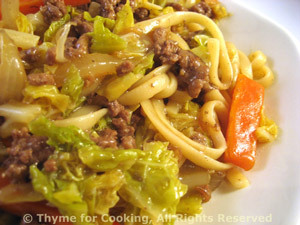 Ground Beef and Savoy Cabbage Lo Mein, quick, easy dinner recipes. Stir-fries cook quickly and are very flexible when it comes to ingredients. I always try for a mix of colors, textures and flavors... Savoy cabbage works in place of the more traditional bok choy. Cut carrot, pepper into matchsticks. Heat olive oil in large nonstick skillet over medium-high heat. Add onion, pepper and carrot to skillet; stir-fry for 2 minutes. Add garlic, ginger, cabbage and stir-fry another 3 minutes. Remove vegetables from skillet and set aside. Add beef, and fry, breaking it up as it browns. Add beef stock and bring to a boil. In a small bowl, whisk together sherry, soy sauce and cornstarch. Uncover skillet and stir in cornstarch mixture until thickened.